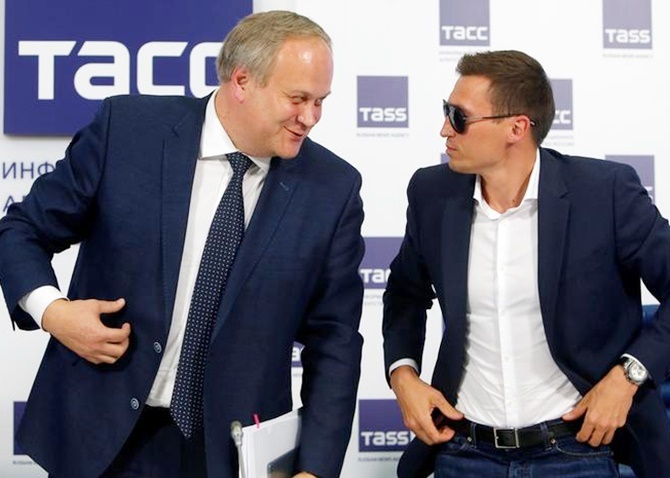 IMAGE: Russian Deputy Sports Minister Yury Nagornykh, left, and cross-country skier Alexander Legkov attend a news conference after rejecting claims that Russian athletes who competed at the 2014 Sochi Winter Olympics were part of a state-run doping program, in Moscow, Russia, May 13, 2016. Photograph: Sergei Karpukhin/Reuters. Russian Prime Minister Dmitry Medvedev has suspended Deputy Sports Minister Yury Nagornykh, who was named in a report on the doping of Russian athletes at the 2014 Sochi Olympics, the government said on Monday. Will IOC chief Bach step up and do what's right?